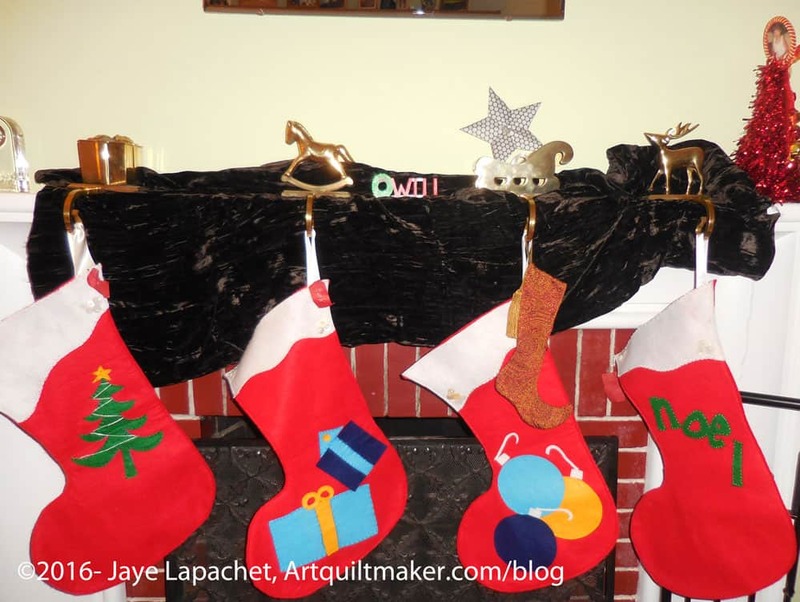 When I went into 2016, I had a list of gifts I wanted to make. As I have mentioned, there was a good portion of the year where I felt uninspired. Many gifts were not made. As I took out the card holder I made for us a few years ago, I thought about what a great gift that was and how hard it is to make something that good again. The siblings and cousins are getting fudge, nothing sewn. I wanted to make a couple of tote bags and pincushions as one-offs for people. I also had the idea to make a couple of Sew Together Bags. There is still a possibility, but not for Christmas 2016. I need to be more organized next year, starting with finding a pattern that has a lot of bang for my buck, eg interesting and usable, but doesn’t take 40 hours to make. I have a week or two before I have to be serious about finding such a project. Nobody died, but I did have a slightly stressful week, which you can see on Instagram and Twitter, if you are interested. I post more about my life there. No quilt related emergencies. 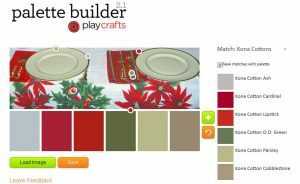 thus, the late posting of ColorPlay and little other posting this week. I also haven’t sewed much. 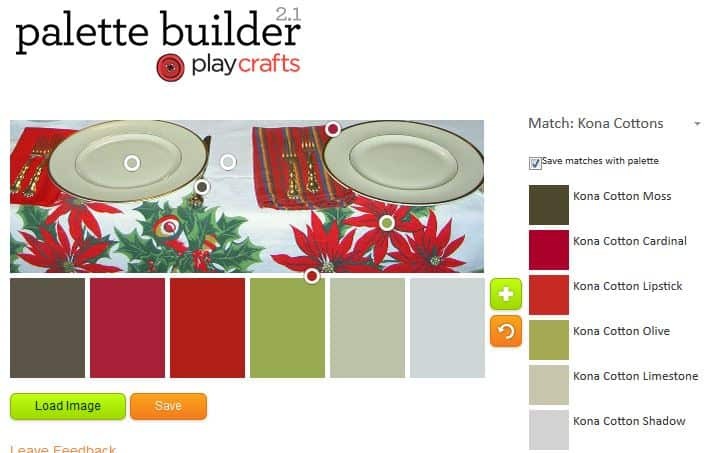 This is an old photo from a prior Thanksgiving dinner, but I thought it would make a nice themed ColorPlay this week. 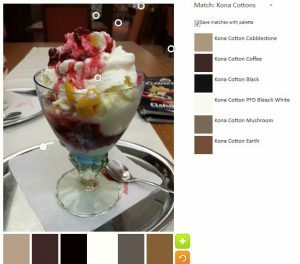 The first color palette is the default. It is what the tool gave me out of the gate; I didn’t make any changes. I really like it, mostly because I got two in the red area right off. I also like the neutrals. I fooled around with the dots a bit on the second option, keeping the reds, but changing up the neutrals. 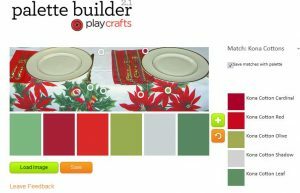 I also added some additional greens, which, though present in the first palette, were not representative of the theme of the tablecloth. Finally, this is my masterpiece. I really like this color palette. 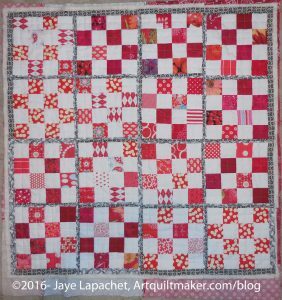 I like the various greens – they are brighter – in combination with the two reds and only one neutral and think it would make a great quilt. In my last post, I talked about how my design method can run into problems. Still, it is the way I work and I don’t want to plan out a whole quilt in each detail before I work on it as there would be no reason to make it. Therefore, I have to cope with design challenges as they come up. I really am struggling with what to place on the top of the quilt. The other day, since I was determined to make progress on The Peacock, I pulled out all of the solids that were in the running for use and put them in order by color. The photos above don’t look very good. It is hard to see the subtle differences in hue. 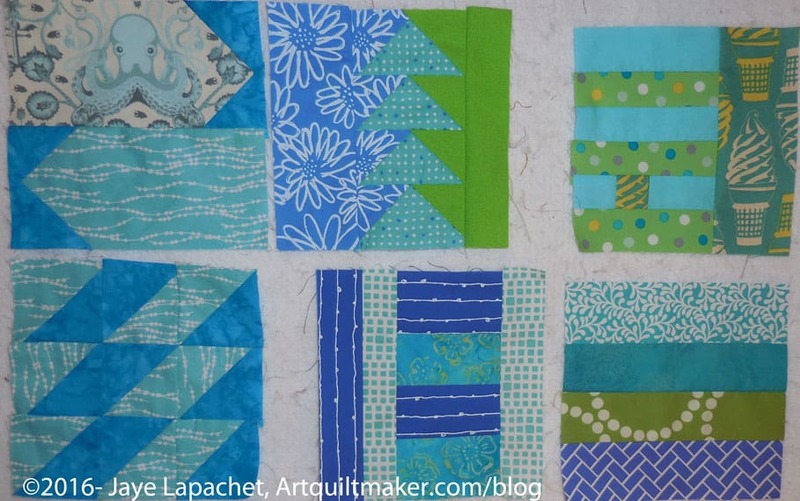 Still, it makes it easier to choose, which blue to put next as I move up to the top of the quilt. 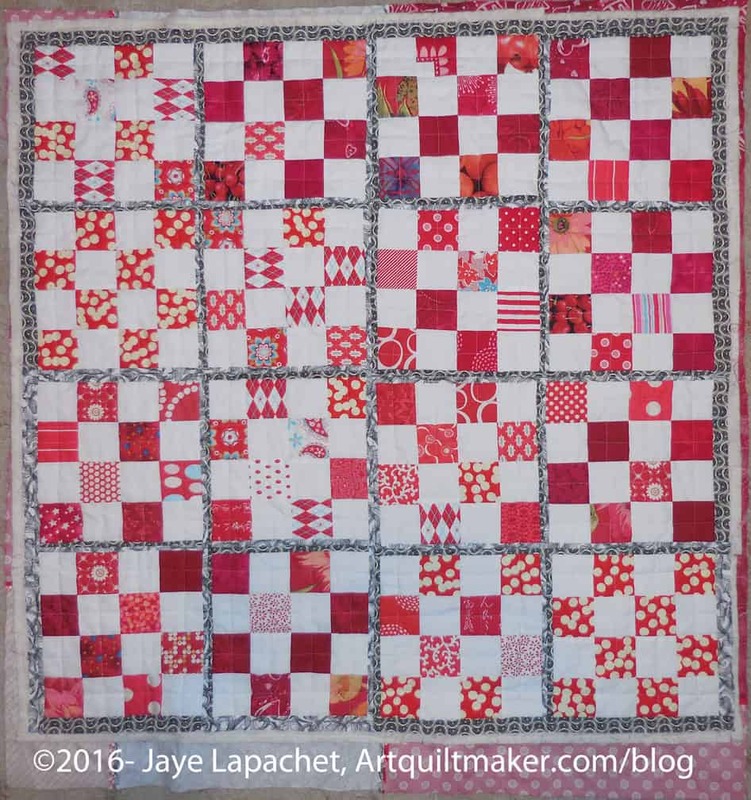 Well, the Red & White Donation quilt is as done as it is going to get on my watch. I am not happy with how long it took to get done or the way it came out. 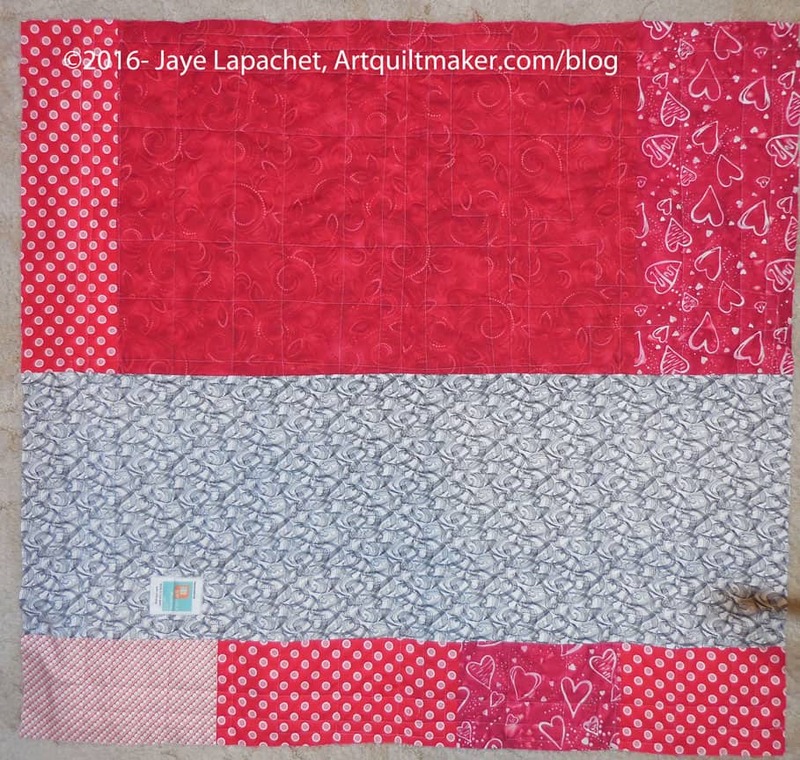 I was under the impression that new, updated QAYG method would make making an entire quilt a breeze, especially since I had the blocks. 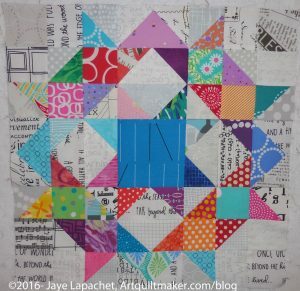 This was my slap in the face that quilts take time. I know this. 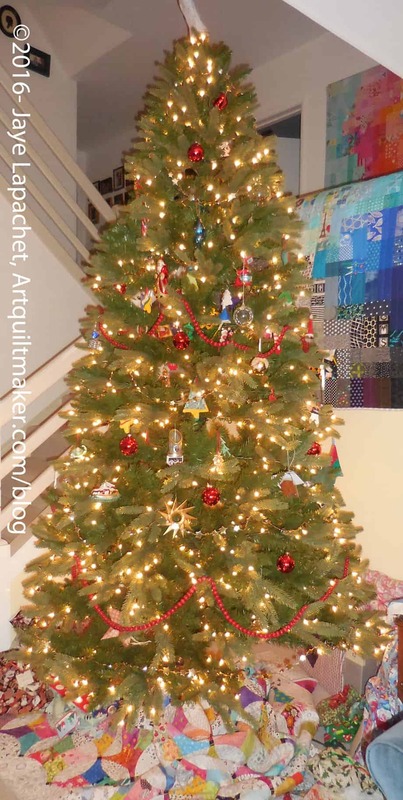 I want to make a nice quilt no matter if it is a donation quilt or one that will lay over my stair railing for the next 10 years. It was a good reminder that quilts take time. I know this, but was lured by a gimmick, I think. 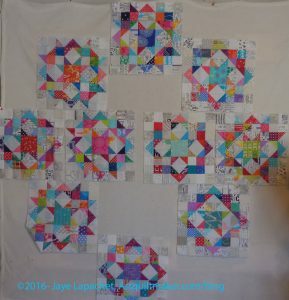 In the process of putting the quilt together using the QAYG method, I lost sight of the design of the postage stamp blocks. You can see that I lined some of them up crazily. 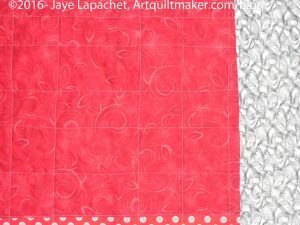 The general method is that the you quilt the blocks on the machine with only batting on the bottom, then you put the back on and quilt some more. 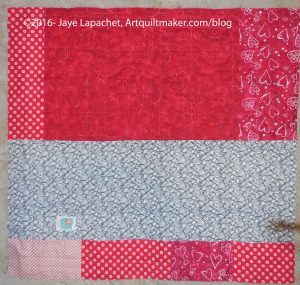 Putting the back on and quilting more was like quilting the whole quilt. This is what confuses me. The quilting you can see on the back is in addition to the quilting I did on the blocks. 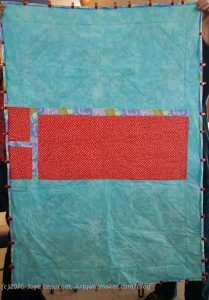 There is enough quilting through all three layers to hold the quilt together. I don’t understand why the QAYG method is easier? 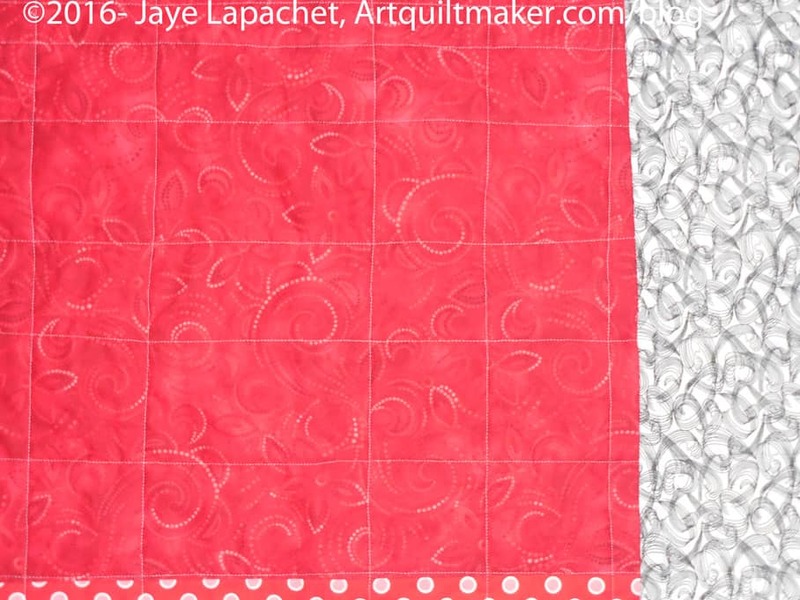 The quilt as you go method that sounded so good when I heard about it. The good part is that I quilted the quilt. The binding just needs to be attached. I even sewed the binding by machine. All that needs to be done is handstitching. I almost brought it to my SIL when I finished to get it out of my sight, but decided that I might do the binding after the Christmas rush. It is put away for now, but we will see. I know someone will like it and it will keep someone warm, so it isn’t a disaster that needs to be tossed: just not up to my normal standards. More torture for you for the sake of color. 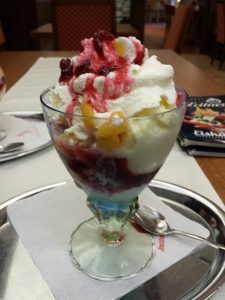 This is an example of a standard sundae you can order at almost any Austrian cafe. 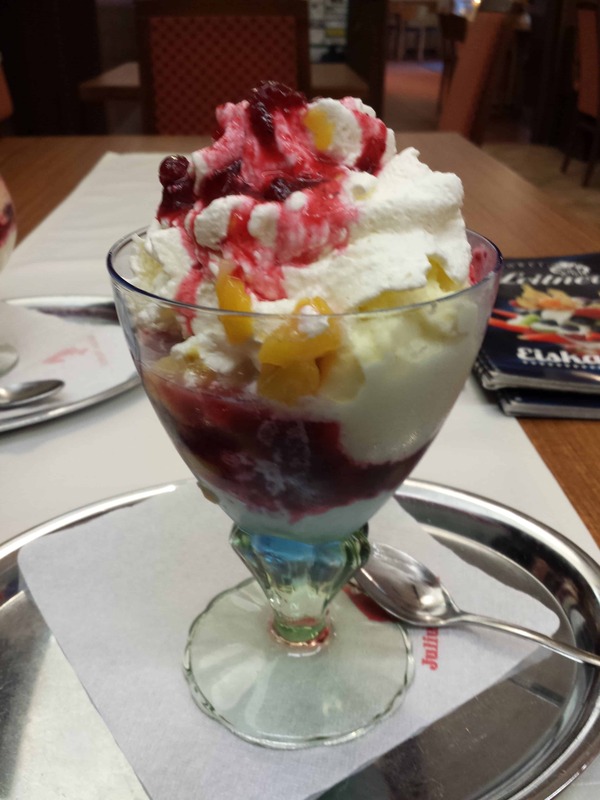 I indulged several times with different sundaes while I was in Austria. 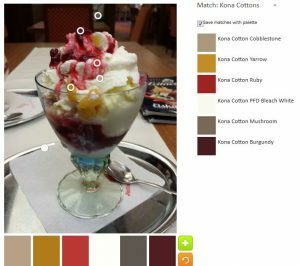 I had this one in Steiermark near GroB St. Florian. I didn’t think much about what I was eating while I was there, though I didn’t stuff myself either. This one is called Pfirsich Melba, I think, meaning Peach Melba. I’d give a lot for another one in Austria just now. The first one, the standard made by the tool, has a load of neutrals as the others in previous editions had. I kind of like the coffee colors and the combination, but would probably never make a quilt with these colors. I get depressed using dark purple fabric in the winter. No pink; I’d get depressed and never finish it or toss it or give it to the Charity Girls. If I ever go live in Hawaii I’ll think about trying a neutral quilt. I made some changes to the location of the circles to get some color. I got some red and a kind of gold Kona calls Yarrow. I wanted to keep some of the neutrals to see how it would look. More color. I needed more color. I didn’t have much with which to work. The third time I put all the circles on the colored areas. Lots of red, mauve dusty rose, which are really called Cayenne, Sienna and Deep Rose in the Kona world. Yarrow is back as well. One thing that this exercise does is it makes me look – really LOOK – at the photos. After trying to get more pink or color, I finally saw the blue towards the base of the dish. 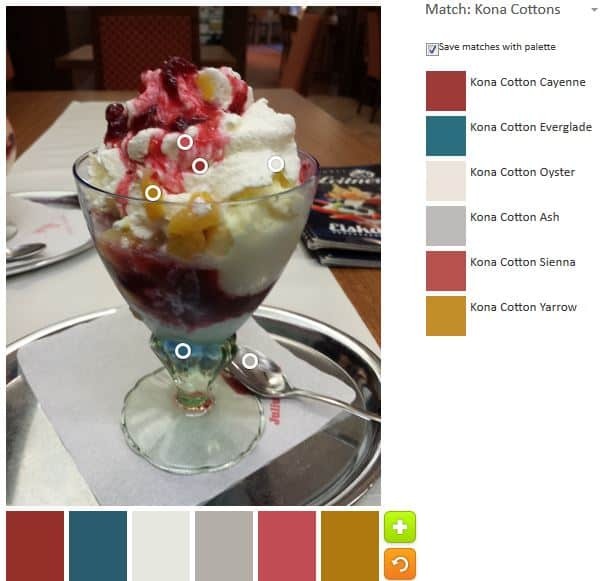 The blue looks lighter to me than the Palette Builder determined. Kona Everglade was added to the mix. As usual, the work paid off and this is the best of the lot. 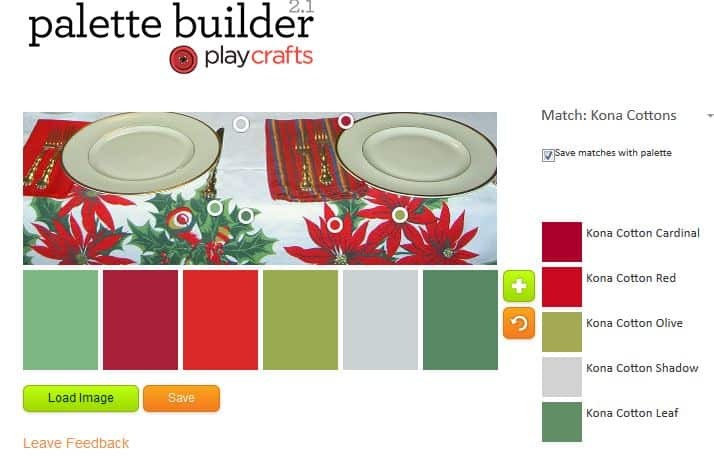 Have you made something with one of the palettes. Let me see it. We had a meeting for NSGW Grand Parlor the other night, so the planning has finally kicked off. In an effort to show people what the boxes I want for the favors to be I went looking on the web. I found a couple of folded paper boxes tutorials, one from Origami Instructions and the other from Simply Notable. Both are essentially the same, but I find it good to get different perspectives, especially with the written word. These are great for gifts. 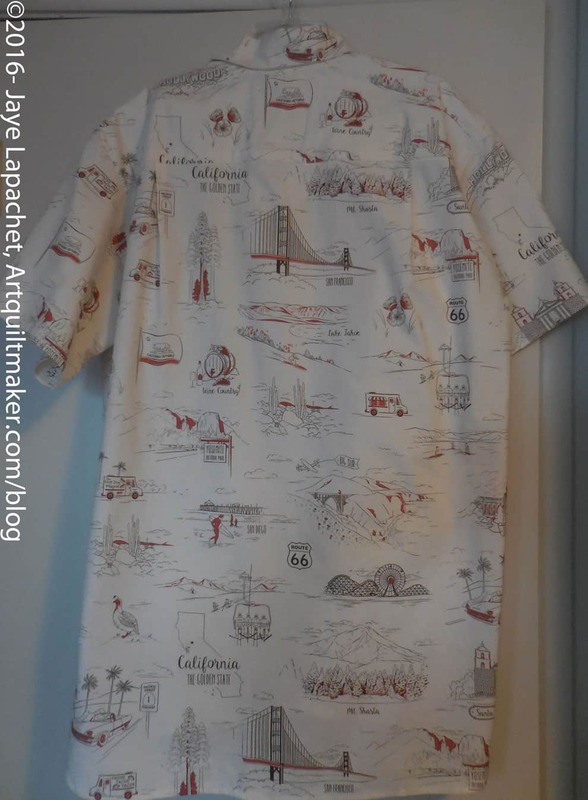 Cut a second piece of paper 1/2 inch larger to make a top. 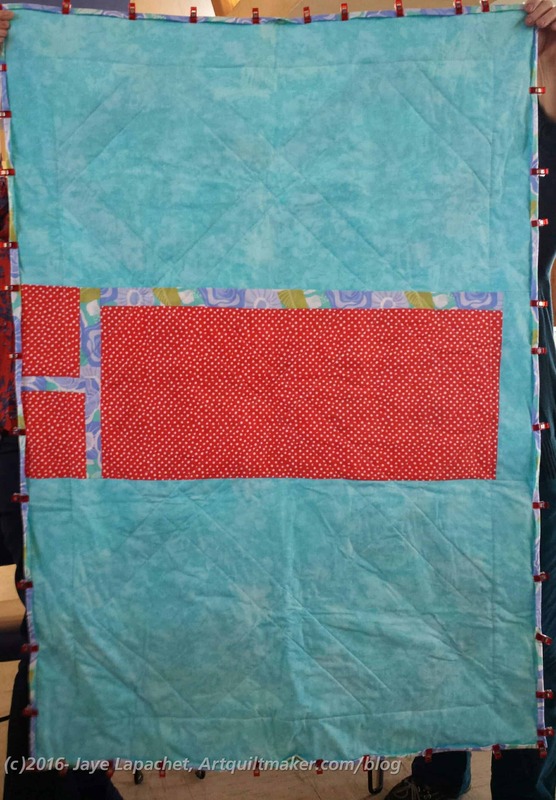 Bonnie Hunter came out with part two and part three of her En Provence mystery quilt. 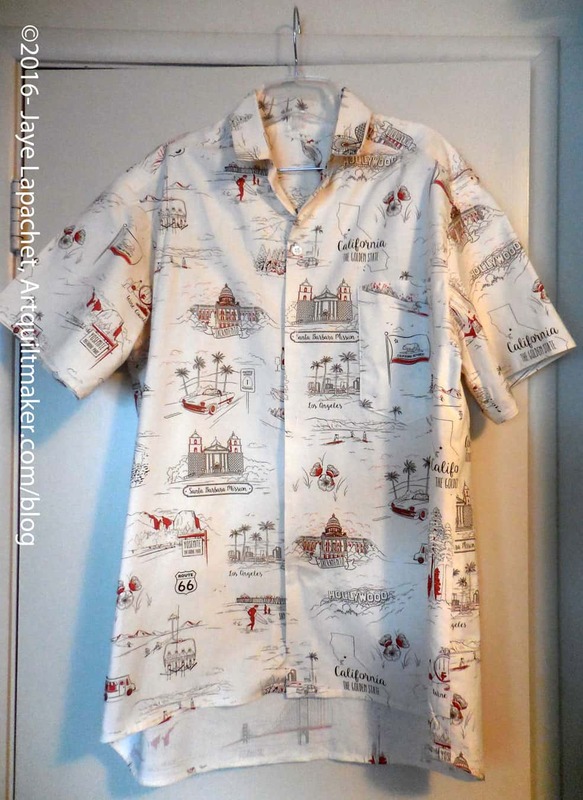 You can find the pattern on her website. Download it now (she has a printer friendly version I save to my computer) as the clues go away in about 6 months. This coffee ornament is a great Christmas ornament, but could also be used for other gift giving opportunities. 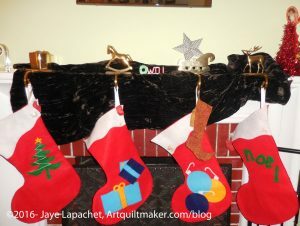 Gift Bag pattern and video from All People Quilt. I still like mine as it is easy to make, but it is great to have options. I have another group of squares for the project. For awhile they came fast and furious as I pressed and cut like a possessed thing. Now I am back to sewing up a storm. 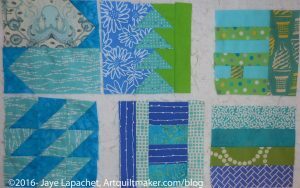 I have a bunch of fabric pressed, but not yet cut. It is such a frustration to have only two hands. This is one of the few times in my life where I’d like to be an octopus. I started in on Carpenter’s Wheels again. 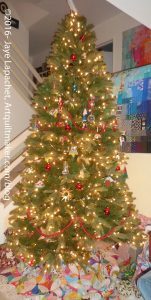 I finished n.13 over the weekend in the frenzy of sewing I did to heal myself from the shopping marathon we did on Sunday*. 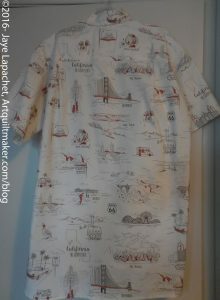 I was able to finish this one without much extra making of parts, but n.14 needed a few new Flying Geese and some low volume fabrics. 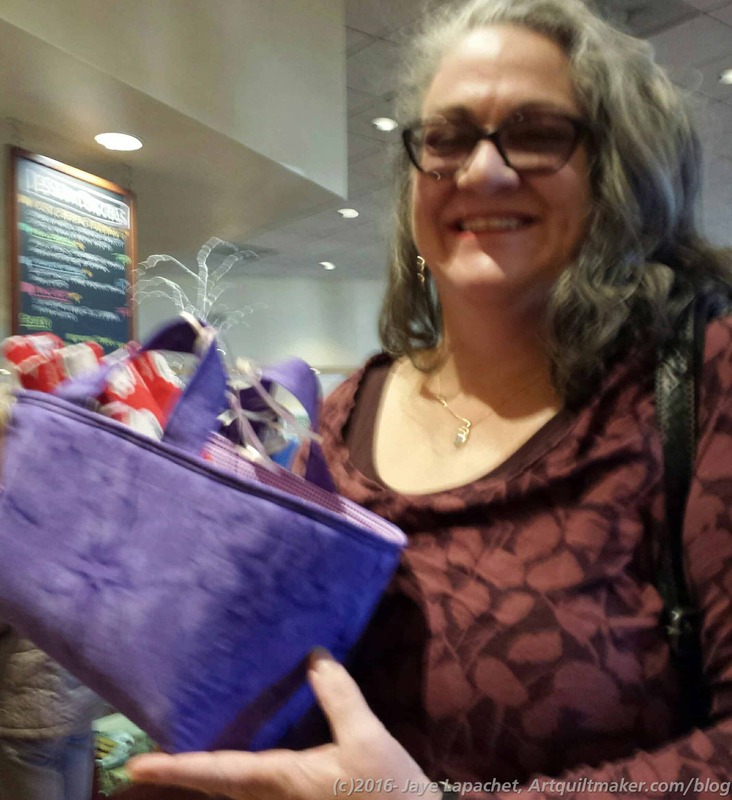 I was inspired to do so by Karen, the Challenges chair at BAMQG. Her last challenge as chair has to do with putting words on a quilt. The Carpenter’s Wheel blocks have text fabric included, so I am going to try to get the top done before February. I know I started this out as an experiment in low volume fabrics and it will still be that. I want to do the round layout. 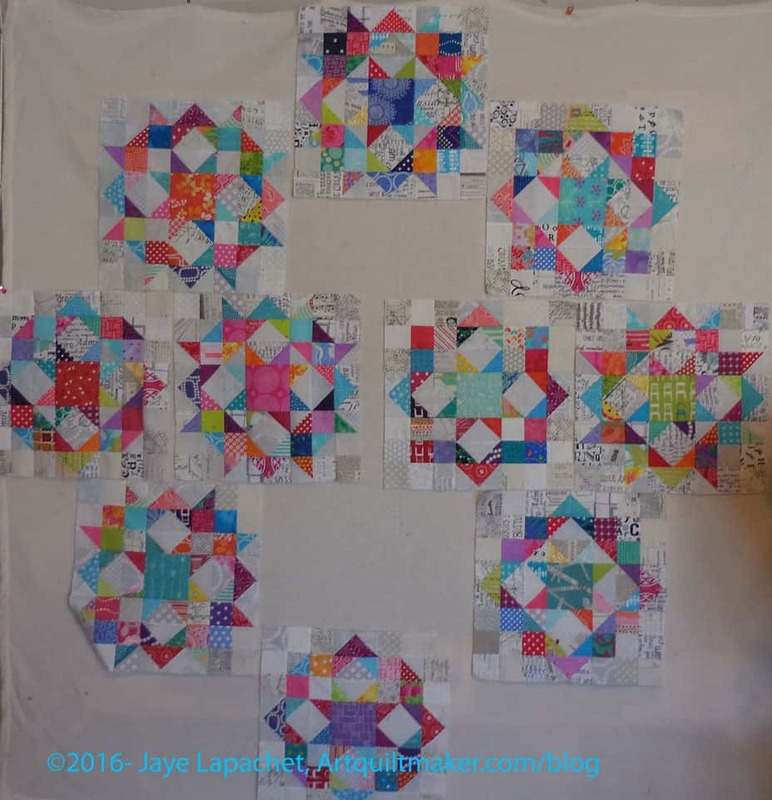 I don’t want those two blocks in the middle, thus I needed two more blocks, which I am in the process of making. 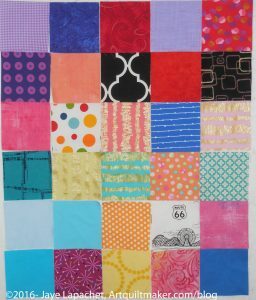 The new blocks won’t be unique layout like the others, but I think the layout of the entire quilt will be somewhat unique and I am excited about it. * Shopping is terrible, but this trip wasn’t completely terrible. DH made me pancakes for breakfast. He and I were able to spend the day together. 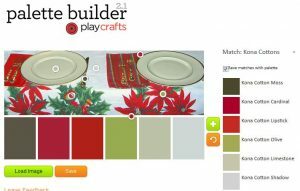 We also accomplished a lot of niggling little tasks that comprise the holiday season. It feels good to cross things off the list. As soon as I said I had had enough, we finished up and packed it in. No arguments from DH. Finally, I ended up with 18k steps. That is almost a Disneyland day. Who would have thought? Don’t you love this photo? We went out to lunch for Julie’s birthday and I took this in the restaurant. Friend Julie‘s birthday is December 1 and generally it sneaks up on me, but this year I was prepared! I got a jump on it. In the frenzy of fabric pressing before Thanksgiving, I found some fabric I had bought to make napkins. I picked out some purples to go on the back and started some napkins. I also decided that Julie needed a One Hour Basket, so I made one of those as well. I bought her some books and things as well, but I do like to make things for people who appreciate them. Also, I feel like I am sewing in place, so a couple of finishes was great. 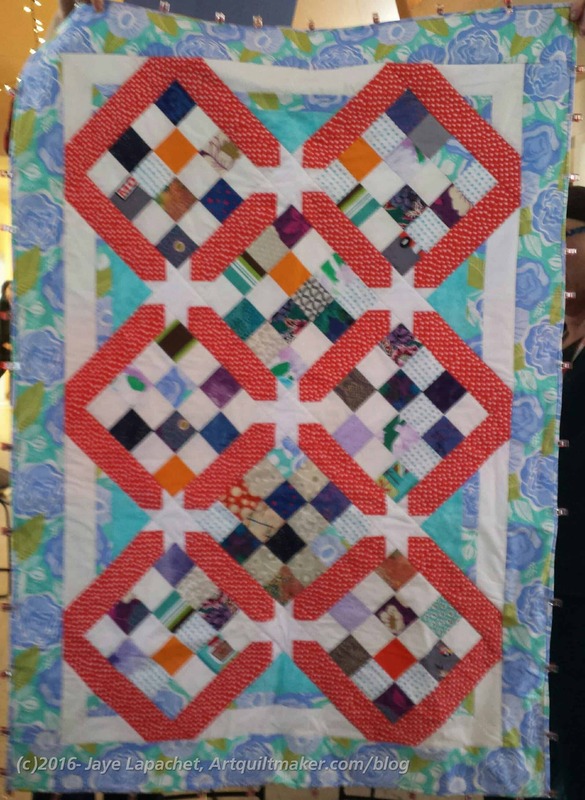 I got a glimpse of my Cutting Corners donation quilt again. Pam is working on finishing it. She quilted it and is now binding it. I know I have said this a thousand times. I love it that I can make something and someone else in the guild will also work on it. It feels like my efforts are not completely mine and somehow more worthy. I made this top and back in March. I knew then it wasn’t the most beautiful top, so I am not surprised it took so long for someone to pick it up and finish it. I think I need to try the technique again with more cohesive fabrics. The above quote cannot be learned. It has to be infused into your bones. The single thing that prevents it from being infused, possibly forever, is someone (mother, father, grandmother, well meaning person) crying “how did you get so dirty?” These simple, seemingly innocuous words can doom someone to a lifetime of cleanliness and perfectionism. I know this because I have only made some strides into messiness. When I am in the midst of projects, my workroom is terribly messy. The boys are scared to walk across the room lest they step on something important. The YM gives me dirty looks and stern admonishments as he walks through the bathroom he uses. The strides I have not made are into dyeing and painting. I do both very occasionally, but they are just too messy. My godmother had a lot of good qualities, but encouraging and supporting messiness was not one of them. However, it is important to encourage creativity and one way is to validate process and exploration. “Life is filled with opportunities and if you are worried about getting dirty or making a mess…then you will be limited in your possibilities” (pg.29). Life isn’t a show. people are messy. Perfectionism “constricts and confines you” (pg. 29). Your life and work “doesn’t have to be tidy. It doesn’t have to be tidy. It doesn’t have to look perfect. But it does have to be true to you” (pg.30). I have started to get rid of fabric that I bought because people said I needed to add ugly fabric to quilts to make them sing. This is not my authentic style: out they go. 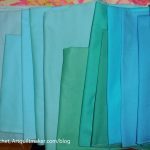 I look at fabric in a quilt store in the context of the fabric I have at home not in the context of the quilt store, so I can bring home fabric that works with the fabric I have. 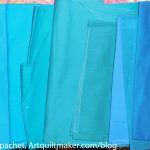 Most fabric looks fantastic in a quilt store; not all fabric looks good in my workroom. 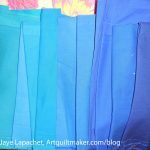 I want the fabric I buy to be authentic to what I am making, so I can include it in quilts that will end up being my style. The other thing is that allowing the messy part out allows you to grow as a person. “Allowing the messy part of the self-the unresolved part- to have a voice is a way of healing and a way of understanding yourself and the world” (pg.30). Not all of your work will be perfect. There will be tears and raw edges and corners that don’t match. You won’t ever get to perfect without these things. In this Spark, I am reminded of the 10,000 hours. Someone said you had to do 10,000 hours worth of work in your chosen field in order to master it. I don’t know if that is true, but if things aren’t going well for me in my work, I think about that and tell myself I have to put in the hours. I was reminded on Saturday, at the CQFA meeting, how much I enjoy hearing about people’s process and how they got to the piece they are showing. It shows work and a process and trying things out that might have sort of worked or didn’t work. It shows tweaking and thinking. Anne Lamott wrote (and Bloomston shared) “Perfectionism is the voice of the oppressor, the enemy of hte people. It will keep you cramped and insane your whole life…Perfectionism is a mean, frozen form of idealism, while messes are the artist’s true friend” (pg.31). Nota bene: we are still working through Carrie Bloomston’s book, The Little Spark. Buy it. There is a lot more to it than what I am writing and it will help you.